Outdoor and sportswear textiles must meet particular climatic and functional demands. So far, water repellent clothes have been finished with fluorine polymers which are highly efficient but also bear risks for the environment. 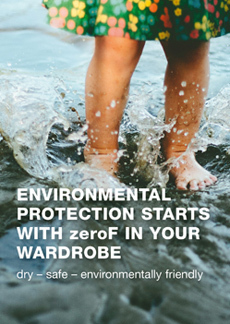 There is also another way – Textiles finished with our fluorine-free alternative zeroF also show very good water repellency and are simultaneously completely environmentally friendly. zeroF is a synonym for innovative and ecological functionality. The textiles stand out for their excellent water repellency and breathability. 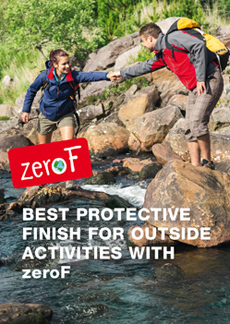 zeroF shows a long lasting performance and is optimally suited for outdoor clothing to brave any kind of weather. Unlike finishes containing fluorine zeroF is based on raw materials which neither during production nor during the application contain or release any environmentally critical substances such as PFOA (perfluorooctanoic acid). The impregnation is produced on a fluorine-free polymer base. 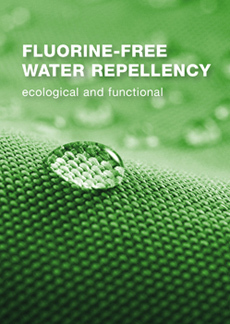 We also offer products for the fluorine-free water-repellent treatment in the fields of Jeans and Garment as well as of Textile Care.